Notice: Michigan has been added to the HUD Installation Program as of May 15, 2017. All installers operating in Michigan must receive a HUD Installer License by October 1, 2017. 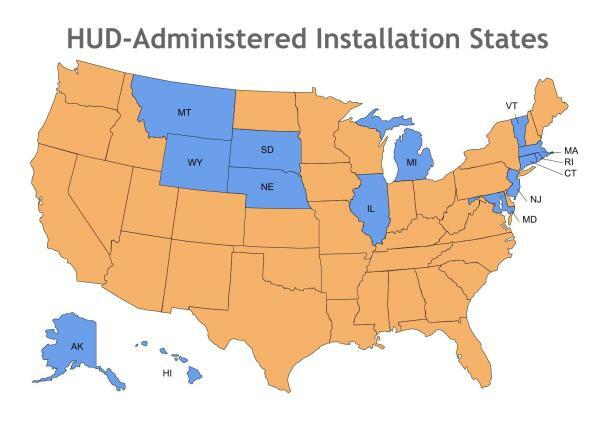 The HUD-Administered Manufactured Home Installation Program has been implemented in 14 states that do not administer their own qualifying installation program and therefore fall under HUD's jurisdiction. The HUD Installation Program includes, but is not limited to, requirements for installer training and licensing, 100% inspection of new manufactured homes by qualified inspectors, and information reporting by retailers and instalelrs. We encourage you to visit the Installers, Inspectors and Retailers pages for more information on all requirements. In addition, a comprehensive program information packet is available for download on the home page . Visit the Frequently Asked Questions page for the FAQs from all conference calls and webinars. Both HUD and SEBA are available to join meetings and conference calls in your state to provide program updates and answer questions. We anticipate the continued growth and success of the Installation Program, which is largely due to industry members that communicate with HUD and SEBA to provide feedback and insight into real-world practices within the industry. Feel free to contact us anytime with questions or comments about the program.